This work is an untraditional look at the chemistry content, of two materials in blood. These materials (Urea-Creatinin) increase in blood if kidney disease is present. Urea-Creatinin materials are the product of Haemoglobin transformations, and the proof of this is mutual relation of Haemoglobin molecules and Urea - Creatinin molecules. This is a new point of view, and offers a new possibility for Oxygen and vitamin treatment of Kidney diseases. This is the explanation of chemistry content,and the explanation creations of Urea-Creatinin. Four theses are connected with-Kidney disease, and intended for doctors. The theses are theoretical, illustrated, and awaiting acknowledgment. Urea and Creatinin evolve in the blood as a result of the transformation of Haemoglobin, and exchange the Iron (Fe) core of haemoglobin with a Carbon (C) atom from CO2 creating the core of Urea - Creatinin. Urea and Creatinin are the same substance. Urea and Creatinin have the same basic form. That basic form can change structure in both directions: - from Urea in Creatinin and from Creatinin in Urea. Urea and Creatinin have a basic form, which can disintegrate with the same method. Natural disintegration of Urea-Creatinin in carbon dioxide and water can explain: Anaemia, Lung-Kidney and Leukaemia diseases. Haemoglobin disease deforms the structure of haemoglobin, and a spiral substance separates Iron (Fe) core from Oxygen (O2) atoms. The transport of Oxygen decreases, and Oxygen is missing in the blood and in cells of the body. The body cells release CO2 (carbon dioxide) that generates hydrocarbon CH4 (methane)in 2H2O (water). Two Oxygen atoms are transferred in the body cells, and these two Oxygen atoms connect with hydrocarbons. core excludes from Haemoglobin and Carbon (C) atom from CO2 is attracted in the structure. Creations with a two Urea structure are possible with connection of four Nitrogen(N) atoms, from one transformable Haemoglobin cell. One Haemoglobin molecule is destroyed, and two Urea or a half Creatinin structure are created. N2 + CH4O2 creates a second Urea molecule. Creatinin form (figure 3), with surplus of 7 Oxygen, 9 Hydrogen and 5 Nitrogen atoms. A Carbon atom core is in the connection with Nitrogen (N) atoms and four Hydrogen (H) atoms. Two pairs of Nitrogen atoms form the chain. The structure of Creatinin is created, but the structure is not compact because it contains different physical properties (Carbon is solid , Nitrogen is gas , Hydrogen and Oxygen is gas or liquid). Therefore four Carbon (C) atoms form the core in Creatinin molecule. Hydrogen, Nitrogen and Oxygen atoms now transform the gas chain by attracting or excluding atoms. A chain reaction continues with 7 Oxygen atoms, and Oxygen connects with Carbon(C) from cells in the form of CO2. The fourth Carbon (C) atom in the form of CO2 is transported by O2 from the body cells, and included in the second Creatinin structure. The surplus of 1 Oxygen (O) atom is included in another Creatinin molecule. Six Oxygen atoms are in the mutual relation with eight CO2 and four 2H2O cycles. This form is the beginning of the next Urea - Creatinin structure. For creating four Urea or two Creatinin structures, two Haemoglobin molecules are transformed. Both Urea and Creatinin have the same beginning; CO2 (carbon dioxide) + 2H2O (water). Water content determines the direction of the chemistry process. CONCLUSION: Urea has two creation modes. 1. O2+ C →(CO2)→ C atom is attracted into the structure, and O2 goes into the next cycle. 2. O2+ C →(CO2)→ C2 atoms are attracted into the structure, and O2 goes into the next cycle. 3. O2+ C →(CO2)→ C3 atoms are attracted into the structure, and O2 goes into the next cycle. 4. 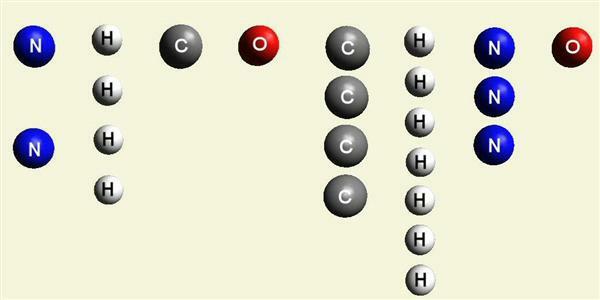 O2+ C →(CO2)→ C4 four carbon atoms form the core. In the next four cycles O2 connects Hydrogen (H) atoms from 2H2O with Creatinin. 1. O2+H4→(2H2O)→ H4atoms are attracted into the structure,and O2 goes into the next cycle. 2. 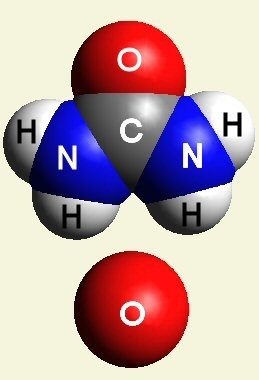 O2+H4→(2H2O)→H8 atoms are attracted into the structure, and O2 goes into the next cycle. 3. O2+H4→(2H2O)→ H12atoms are attracted into the structure, and O2 goes into the next cycle. 4. O2+H4→(2H2O)→ H16 atoms are attracted into the structure, and O2 goes into the next cycle. In the two Creatinin structures there are eight Nitrogen (N) atoms from two transformed Haemoglobin molecules. The valency of the Iron (Fe) is only two electrons in the 4. shell. Carbon has four electrons in 2. shell , and a stable CO2 connection. The central atom changes place, and the Carbon (C) atom changes the structure of Haemoglobin. Free Oxygen (O2) atoms in the next cycle transport four Hydrogen (H) atoms. Hydrogen is transported with Oxygen in the form of 2H2O. Urea and Creatinin have the same basic form (CO2 +2H2O), and possibly for disintegration by the same method . Vitamin B6 substance - Pyridoxine metabolises protein and amino acids. Amino acids contain (N) Nitrogen atoms, and with B6 vitamin, amino acid converts into Protein. Protein gives muscle energy. Pyridoxine helps in removing the Nitrogen from amino acids, making them available as sources of muscle energy. When Urea -Creatinin is disintegrated, all its chemical elements are included in the amino acid. Carbon atom is the core, with a Nitrogen connection in the atoms structure. Amino acids contains many different elements. In the graphic below we see two graphic molecules together. Balancing Creatinin is possible with Oxygen O2 atoms. The result of disintegration is 4H2O (water molecules) and O2 Oxygen for the next disintegrated cycles. Balancing Creatinin is possible with Oxygen (O2) atoms. The result of disintegration is that CO2 and H2O are present in all combinations, and the creation of Urea Creatinin occurs continuosly. The breathing of Oxygen 2O2 is important to prevent the initiation of chain reactions and Urea-Creatinin creation. Oxygen 2O2 is connect in the lungs with haemoglobin's Iron (Fe) core. In the cells of the body 2O2 Oxygen disintegrates into O2 + O2. Oxygen for cell breathing connect Carbon from cells and in form CO2 is breathed out into the atmosphere. One Oxygen O2 atoms go into the body cells, and a second Oxygen O2 atom connects with a Carbon (C) atom and leaves the body cells in the form of CO2. This is normal healthy 2O2 cycle. Disease develops according to the CO2 % that remains in the blood after the lung gas exchange. which accumulate in the Glomerulus,and prevent H2O water secretion. Water accumulates in the blood, and the creation of Urea Creatinin begins in the reaction with Carbon dioxide. the natural breathing out of the (CO2) in the atmosfere and the kidneys secretion H2O. The transformation from Haemoglobin in Urea - Creatinin is a slow process. Disintegrated elements CO2 and H2O are naturally excreted by the lungs and in the kidneys. The transformation from Haemoglobin in Urea-Creatinin is a slow process. The lungs do not excrete the disintegrated element CO2, and carbon atoms increase in the blood and accumulate in the glomerulus. Secretion of H2O by the Kidneys decreases, and both CO2 and H2 O increase in the blood. The initiation of a chain reaction CO2 + H2O is created. 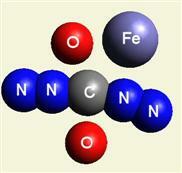 Oxygen and Iron insufficiency cause CO2 central atom changes. Carbon atom is basic for the transformation of Haemoglobins in Urea Creatinin, and can help in understanding Anaemia, Kidney disease and Leukaemia. The transformation from Haemoglobin in Urea Creatinin is individual. Naturally disintegrated elements CO2 and H2O are naturally excreted by the lungs and kidneys. Haemoglobin disappears and Urea Creatinin is not created. A characteristic of Leukaemia is unbalanced Lung - Kidney function. The Carbon atom from CO2 is removed, and free O2 connects with Hydrogen atoms. The connection of Oxygen and Hydrogen atoms has H2O and 2H2O forms. Nitrogen atoms from destroyed Haemoglobin cells do not create Urea Creatinin because of the missing Carbon (C) atom core (CO2 excreted by the lungs). Low Oxygen and haemoglobin cause tiredness. The kidneys normally separates H2O and the disease can hide and diagnosis is difficult. I have a subconscious instinct to search for the cause of my disease. Despite ten years of treatment, the disease has not been cured. has progressed. I believe that by continually searching I must eventually achieve results. Suddenly one night, my subconscious mind began to dictate this theoretical work. All my arguments have the aim, discussions in doctor's circles and practical acknowledgment or excluding. The transformation from haemoglobin in urea-creatinin is a slow chemical process. When chemical transformation is finished, the creatinin molecule excludes H7N3O in one solidification process (Figure10). The solidification process attracts central C4 carbon atoms to the centre of the molecule and excludes atoms from the periphery. and remain NHO-nitrogen, hydrogen and oxygen atoms attract NHO-nitrogen, hydrogen and oxygen atoms from another creatinin molecule (see two graphic molecules together). N2 can remain in the blood or can be excreted in urine. 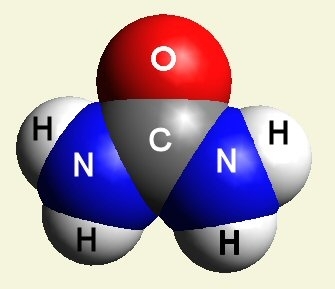 Excluded H7N3O atoms form one NH3 (ammonia) molecule, one H2O (water) molecule, and N2H2 nitrogen and hydrogen atoms. Solidification process (one graphic molecule)(Figure11). The body performs self regulation of water. , and blood has a high concentration of CO2 (carbon dioxide) See Carbon dioxide and CH4 (methane) See Methane . This is very important for the separation of O2 (oxygen) and H2O (water) from CO2 (carbon dioxide) and CH4 (methane) gas molecules. The kidneys' glomerulus separates chemical elements and accumulates carbon in capillaries. Carbon atoms create a nanonet and include C (carbon) atoms and exclude remains. The remains of the chemistry elements pass or not pass across the nanonet. The carbon atoms' nanonet includes C (carbon atom) from CO2 (carbon dioxide), and excludes O2 , two oxygen atoms see Oxygen. From molecules, CH4 (methane) separates carbon, and excludes H4 hydrogen atoms. Excluded O2 and H4 create O2+ H4 → 2H2O (Figure 12). This water remains in the blood or passes across the carbon net. The carbon nanonet enlarges volume and decreases flow in the capillaries, accumulating more and more excluded chemistry elements, finally creating a blood clot. Solidification process and chemistry transformation is finished. The cell haemoglobin [C] value is the number (5), which indicates the (creatinin molecule) number. Cell haemoglobin has 4 haemo with (Fe) iron atoms in the centre (Figure 13). Calculated with 16 nitrogen atoms in 4 haemo as basic (Figure 14). Cell haemoglobin has 16 N (nitrogen atoms). This is enough to create 5 creatinin molecules, and 1nitrogen atom remains as a surplus. Two cells of haemoglobin are enough for 10 creatinin molecules and 1 urea molecule. 10 creatinin molecules and 1 urea molecule have 10 x 4 + 2 = 42 (C) carbon atoms see Carbon data..
Disintegration of two haemoglobin cells can create 42 carbon atoms and a nanonet clot. Carbon atoms accumulate as a cap in the glomerulus capillaries. The C4 carbon molecule is stable and can connect with another carbon molecule chemically. Components of urine are chemically excluded molecules end atoms; that is chemistry excludes elements and they cannot be connected. Clots in the heart, brain and the kidneys clot form due to the different pressure. Those components have characteristics in the LAWS OF PHYSICS. Each blood vessel has a different pressure, speed flow, flow resistance, and blood consistency. The pulse is a time characteristic. Different pressures in the body are measured in (mmHg). The pulse is measured in beats per minute. It is measured in mmHg for systolic blood pressure and diastolic pressure,and pulse measuring is separated. Blood flow is a pulse component; flow resistance and consistency are pressure components and depend on temperature. In flow resistance mmHg/d (d = diameter) (for exam... the diameter of the afferent arterioles is equal to the sum of the diameters of all glomerulus capillary vessels). decrease pressure inside the glomerular capillaries (Laws of Physic). Speed increasing maintains the blood amount, and the diastolic blood amount remains equal to the systolic blood amount. Each body has individual blood pressure and different blood vessels. There is a specific blood pressure ZONE (Figure 14.1) for precise blood pressure, for each organism. Medical blood pressure decreases or increases can move capillary filtration from the Bowman's capsule (Table 1). If blood pressure decreases, capillary vessel pressure increases and creates a different pressure in the Bowman's capsule. This pressure is not equal to the pressure in the Bowman's tubule, and no filtration from the glomerulus occurs. Different pressure between blood inside capillary vessels (glomerulus) and urine outside capillary vessels in Bowman's capsule and the proximal tubule (Figure 15). Pressure between blood inside capillary vessels (glomerulus) and urine outside capillary vessels in the Bowman's capsule and the proximal tubule (Figure 16) must be equal (Laws of Physics). Capillaries separate all chemistry elements at equal pressure or hold back because of differences in pressure. Different pressure between blood inside capillary vessels (glomerulus) and urine outside capillary vessels in the Bowman's capsule and the proximal tubule (Figure 17). Blood pressure varies depending on the body's activities (sleeping, drinking alcohol or coffee, walking, working .....). These activities can move capillary filtration from and back to the Bowman's capsule. Blood pressure increases and decreases, Blood speed increases and decreases and capillary pressure oscillates and regulates flow. Changes in speed flow change blood consistence in the capillaries (Law of Physics). Regulation of pressure in the Bowman's capsule is carried out by each organism itself. Blood pressure oscillation is the difference in the blood amount; in an analogy with physics, this is only fluid weight expressed as force. This force holds capillary valves open or closed (see next videos for the analogy between blood clots and capillary valves). More fluid means more force, and more force means more closed capillary valves (Figure 18). If pressure A is greater, the capillary valve is closed. If pressure B is greater, the capillary valve is opened and flow is opposite. If pressures A and B are equal, the position of the capillary valve is irrelevant (no pressure influence over capillary valve). This means that the capillary valve is leaky in both directions. This law of physics can be used in glomerulus cleaning, by using equal fluid pressure (between blood and urine). This principle is also used in peritoneal dialysis (see Peritoneal dialysis)..
Dialysis fluid has fluid weight as force and this force opens the capillaries in the stomach (osmotic flow). (Example: Peritoneal dialysis 1.36%W/V/13.6 mg/m has the chemical formula C6H12O6. This means 6 C atoms and 6 water molecules. 4C (carbon) atoms can include only two ammonia molecules (see Figure 10), or one ammonia molecule and one water molecule (see Figure 11). These chemistry elements can be included only if pressure is equal. If the pressure is not equal, capillaries accumulate clots on the high pressure side. When (blood and urine) pressure in the Bowman's capsule is equal, blood clotting is irrelevant because flow is osmotic and free in both directions. - Fluid pressure is different when fluid height is different, (fluid weight and fluid height are forces). - Fluid pressure is equal when fluid height is equal. - Equal fluid height opens capillary osmotic flow (fluid mix in experiment.- See Figure 20). The pressure regulating valve secures urine flow. The regulating valve is normally closed and it opens with positive pressure (example 18 mmHg). Regulating valve implants are placed in the side of one or both ureters . After implantation, ureters are closed and accumulate urine. When urine pressure comes (for example at 18 mmHg), the regulating valve loses the surplus of urine and by closing, secures a constant (18 mmHg) pressure. This pressure is EQUAL throughout (ureter, renal pelvis, distal tubule, proximal tubule, Bowman's capsule, afferent and efferent arteriole) the whole urinary system. Equal pressure ensures secretion of urine (see Figure 21). The pressure regulating valve defines the volume of (ureter and renal pelvis). This volume defines the urine amount and weight (valve opening force). If the urethra and pelvis volume are 2350 mm³ then the approximate max systolic pressure is 168 mmHg and the calculated value for the valve is 168 / 10 = 16.8 = 17 mmHg.